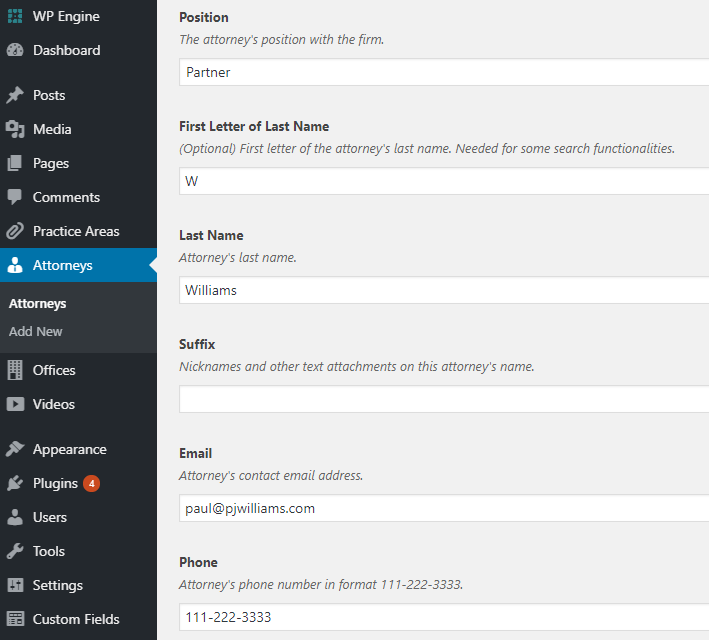 At PaperStreet, we specialize in building websites for law firms, and our code does, too. Most every website we’ve produced over the last half decade was built with thoughtfully chosen law firm-focused content sections called custom post types. These areas organize the attorneys, practice areas, and offices on your site in an easy-to-update manner. In this post, we’ll cover the topic of “posts” in WordPress; what a custom post type is; and how we use custom post types to make your firm’s website content editing experience better. If you log in to your website’s administration area, you’ll see a handful of links on the left bar. A selection right at the top that immediately catches your eye is called “Posts,” and “posts” are really what WordPress is all about. But here’s the thing: Technically, everything in WordPress is a “Post.” Posts are “posts.” Pages (general pages like “About Us,” “Our Firm” or “Contact”) are “posts.” And each of your “Attorneys” posts is a post. 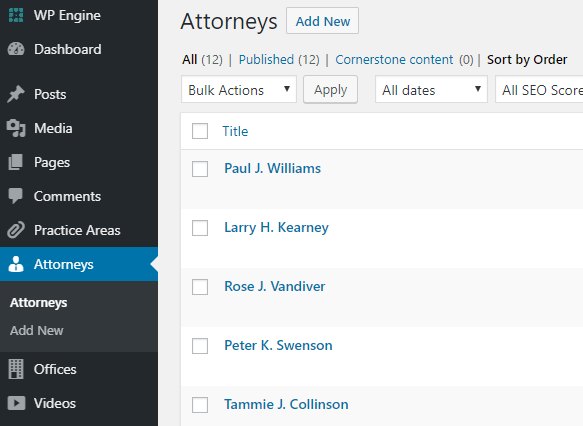 The difference is that “Posts” and “Pages” occur as part of every WordPress install by default, while “Attorneys,” “Practice Areas” and “Offices” are specially built by PaperStreet. These are known as Custom Post Types, and they function quite similarly to regular old posts and pages, with notable differences. Custom post types are excellent for organizing content. Even better, they allow us to set up specific functionality and data fields per post type. For example, if both your office location “Miami” and your newest associate “Johnny McJohnson” had content stored under “Pages” in the website, there would be limitations. First, everything would be listed under “Pages,” making this section difficult to navigate. But beyond that, “Miami” and “Johnny” might need different sets of information stored about them. An address would be great for the office, while a list of Johnny’s areas of practice could help. But we wouldn’t need those same fields on both posts. This is where custom post types come in. Just a few selections down from “Posts” is where we place our custom post type, “Attorneys.” Click into here, and let’s have a look around. Under “Attorneys,” you won’t find anything about a blog, nor a listing of offices. It’s just a list of people at your firm, each with their own post. If you click into an individual post, you will find it looks a lot like editing any other page. There’s space for a title, a main content block, and an “Update” button on the right to save your edits. These data fields are important because our development team ties them into templates on your website to inform where the attorney’s phone number is, or what office location the attorney works at. Maintaining this data – and entering content into fields consistently – is important for information accuracy and presentation. Know that if your website needs certain custom fields to accept specific data per attorney, we can set that up for you. So how do our other custom post types, like “Offices” and “Practice Areas” differ from “Attorneys”? Not by much. Click around, and you’ll find they are fundamentally the same, with the primary purpose of organization. As mentioned previously, “Offices” include fields for address and map information which “Practice Areas” do not, but on the surface, the interior of these posts look the same because they are all posts. Spending a little time poking around your website WordPress admin area is empowering, not intimidating. We put care into our WordPress themes to organize them in an intuitive, user-friendly manner, and we think you will agree. Need a custom website of your own, chock full of custom post types and data fields? Contact us today.